It&apos;s going to be a great weekend in Wilmington, Delaware and the Brandywine Valley! Here are our picks for your weekend itinerary – and don’t forget to share your travel pictures using #VisitWilm on Instagram & Twitter! Celebrating Delaware&apos;s 241st year of independence from Pennsylvania and the British Crown! On June 15, 1776, Delaware was born when it enacted measures to separate itself from the State of Pennsylvania and Great Britain. Head to Historic New Castle for a two day celebration in the town where it all took place! The two-day festival includes live entertainment, demonstrations, arts & crafts, a 5K run, amusement rides, a parade, craft beers, food trucks and food vendors. The celebration concludes with fireworks on Saturday night! The parishioners of Holy Trinity Greek Orthodox Church take you on a trip to the Old Country where you can close your eyes and imagine yourself in a Greek village where locals are celebrating an annual event. Experience the aromas of authentic food cooking before your eyes, the sounds of ethnic music and the sights of the Greek Terpsechorian Youth Folk dance group - all in one family fun festival! Admission is free and rain or shine. 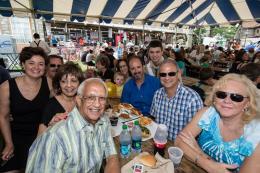 St. Anthony&apos;s is hosting the 43rd annual Italian Festival - a week-long celebration of authentic Italian food, culture and entertainment in Wilmington, DE! This year&apos;s theme is Sicily. Visitors will enjoy food, music, art and more, that embody the Sicilian culture. Daily Admission is $5. $15 Weekly Passes are available.